Whin bushes on heathlands and mountainsides give a marvellous gold colour throughout much of the year - see this site. But beware - they are VERY thorny! For this reason, they are sometimes used as a barrier to contain sheep and cattle, hence Whin Dyke (= gorse wall or hedge). The long flowering season has given rise to this saying: "When gorse is out of blossom, kissing's out of fashion". 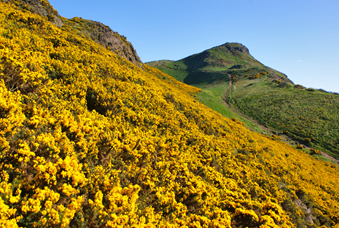 Arthur's Seat in Edinburgh in its full spring glory.